Add seasonal flavors to a simple caprese salad with slices of fresh peaches. 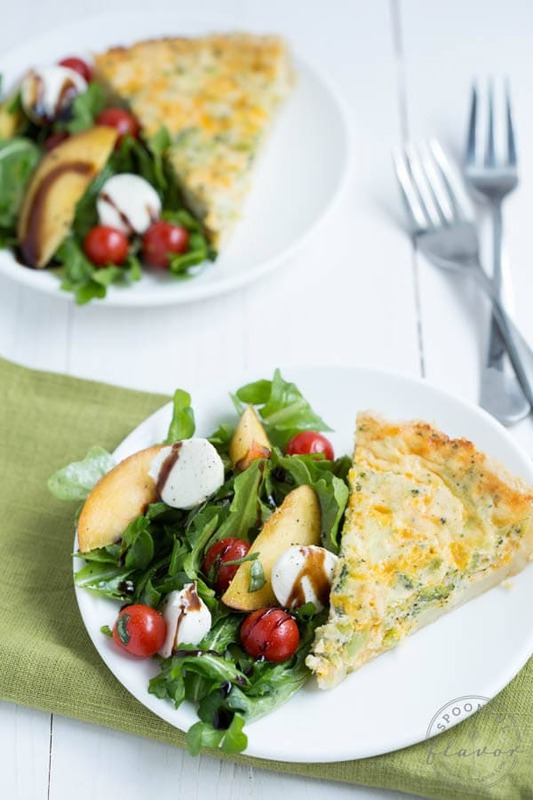 Top with a drizzle of balsamic dressing, serve with your favorite quiche or other dish and you have a fresh and easy meal that makes summer entertaining easy! Every year during the summer I have the most beautiful Matt’s Wild Cherry tomatoes in my garden. They are the only tomatoes that I have really good success growing and they are juicy, slightly sweet and packed with flavor. I love to snack on them and they are the perfect addition to a simple salad. To create a simple peach caprese salad with fresh seasonal flavors, I combined fresh peaches, mozzarella, tomatoes and arugula. 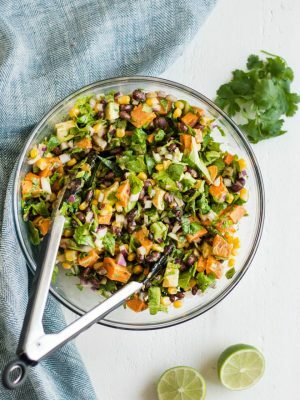 Pairing the salad with a quick and easy dish is the perfect meal for simple summer entertaining. I’ll be honest. I do not cook every single meal from scratch. Frequently, I will pick up a rotisserie chicken from the grocery store or a prepared meal that I can heat up in my oven quickly. I try to find something with natural ingredients and minimally processed. Especially during the summer, I want to finish working, make a quick dinner and enjoy time outdoors. 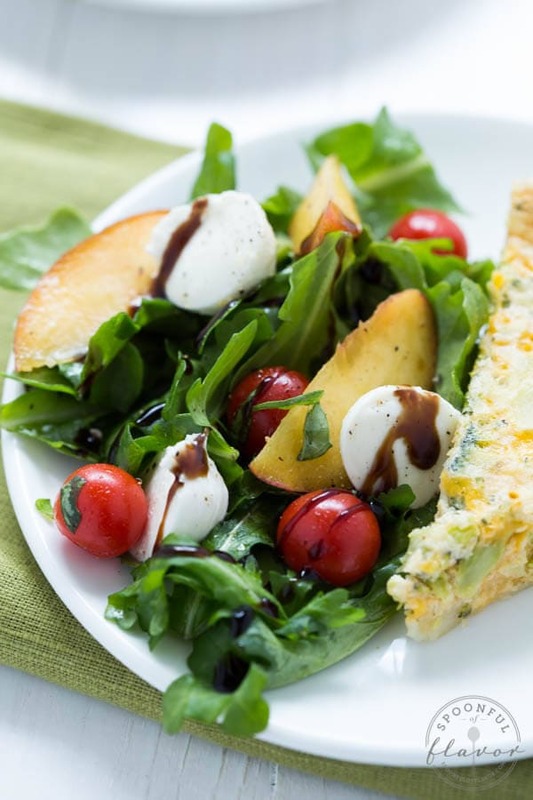 One of my favorite meals this summer is a La Terra Fina quiche paired with this peach caprese salad. With no artificial flavors or preservatives, the savory quiches are made with natural ingredients. 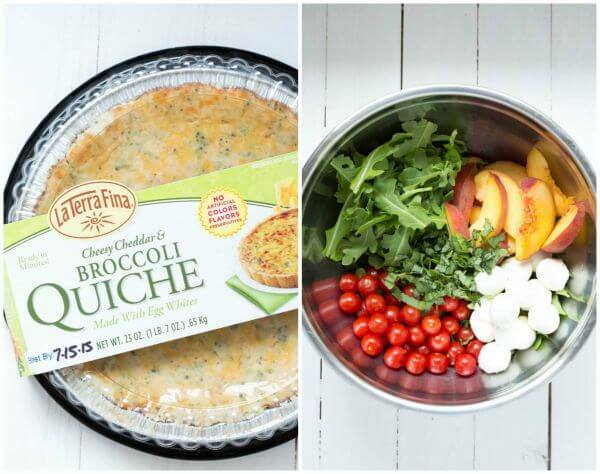 Available in 6-ounce and 23-ounce pies, the quiches only need to be baked in the oven for a short amount of time. 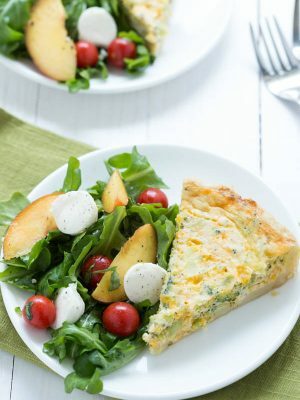 I paired the peach caprese salad with the Cheesy Cheddar & Broccoli Quiche. I also really love the Quiche Lorraine and Spinach & Artichoke Florentine. 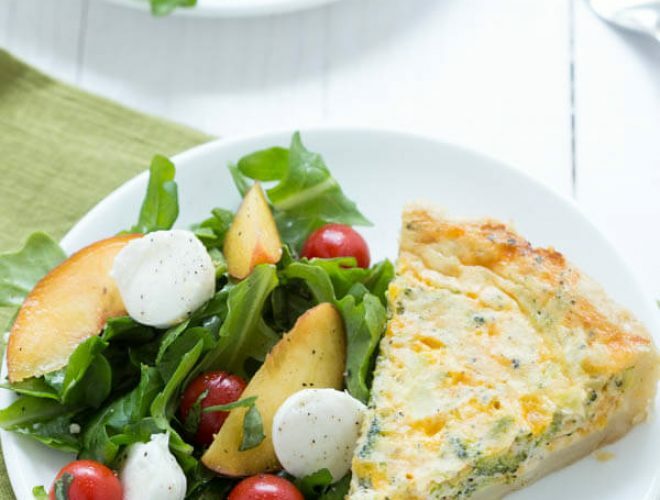 Pair this salad with a flavorful La Terra Fina quiche and you have an easy meal perfect for brunch or dinner. Best of all, it makes summer entertaining easy and is a meal that the entire family will love! To prepare the balsamic reduction, in a small saucepan over medium-high heat, bring balsamic vinegar to a simmer. Reduce heat to medium-low, and simmer until the vinegar has reduced to 1/4 cup, about 20 minutes. Set aside and let cool. In a large bowl, toss arugula, basil, olive oil, and lemon juice. Divide among serving plates. Top with mozzarella, tomatoes and peaches. Drizzle with balsamic vinegar. Season with salt and pepper and serve. This salad looks fantastic. I love adding fruit to my salad! This would be a great way to use up extra basil in my garden too! Win Win! 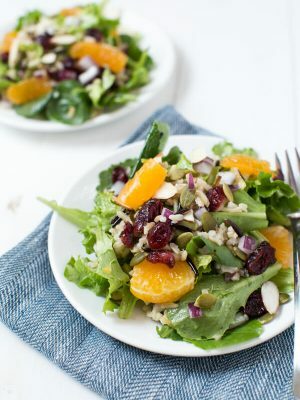 This is SUCH a gorgeously stunning salad, Ashley! What a genius idea to combine peaches with caprese! Love it. :) Pinned! 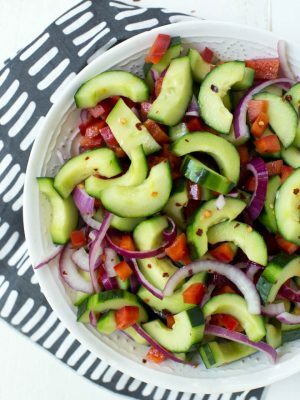 wonderful looking salad Ashley, it's summer in a bowl! This looks like the perfect week-night dinner! I need to try peaches & caprese, looks just amazing! 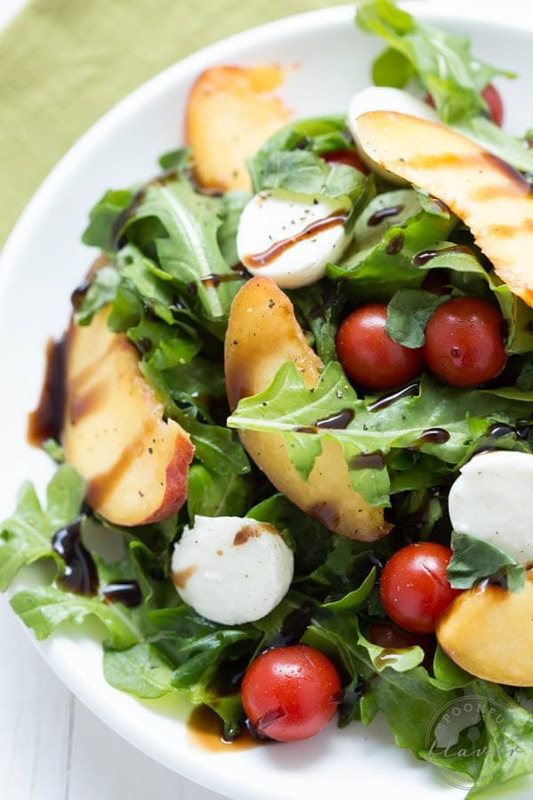 I love caprese salads in any form, and the peaches here sound delicious! 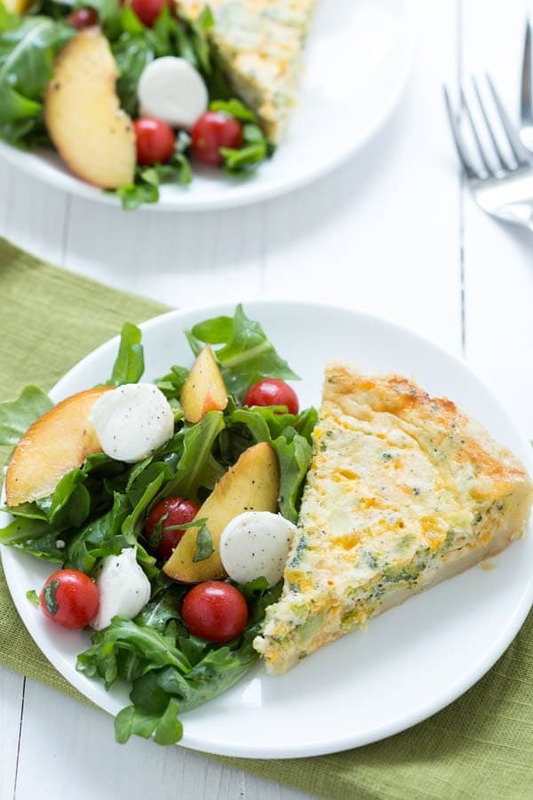 This is the perfect side dish for that quiche! The addition of peach to classic caprese salad is absolutely brilliant!